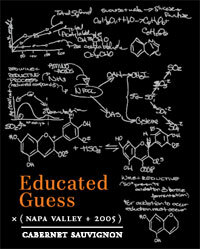 I don’t have too much to say about Educated Guess other than it was one of the most interesting Cabernets I have ever had the pleasure to drink. It was incredibly smooth with flavors of juicy blackberries, boysenberries and creamy vanilla. I think it may have been the creaminess that made it so unique. That’s not a texture I’m used to in a Cabernet. I wanted to hold each sip in my mouth, close my eyes and savor it. It was jammy without being overly sweet. It was a true delight. I will say this, however. I ordered this wine at a tapas and wine and tapas bar called Oporto which specializes in Portuguese wines and foods. They offer other options, of course, or I would never have ended up with this lovely Californian variety from Roots Run Deep winery. I just didn’t love the wine as much with any of the foods that we ordered. The wine was ordered before the food (obviously first priority). We ate curried lamb meatballs, lump crab meat crepes with bechamel sauce, a marinated portobello mushroom stuffed with spinach and cheese and finally baked brie with fig preserves, strawberries and sliced pears. Does that sound like a delicious meal or what? Oh it was. The Educated Guess didn’t taste unpleasant with the food… it just didn’t add anything to the meal and the meal didn’t accent the wine, either. This is definitely a wine I would buy again, but perhaps just to enjoy on its own. I have not found this wine in a store yet but am keeping my eyes open for it. After doing a little research I learned that all the chaos on the label is actually meaningful. Those are five different formulas that are used in winemaking. Who knew? If you are in Houston and happen to make it over to Oporto on Richmond (which I would highly recommend) you should try the Estampa Cabernet/Syrah blend from Chile. This was my companion’s order and upon first sip I was certain I had once again out-ordered him. It was almost too dry but once it had a second to open up and breathe in the glass it was absolutely gorgeous and it was even better with everything we ordered. I am always impressed with a wine that can pair beautifully with so many different types of foods. That is no easy task. It was definitely much drier than the Educated Guess and had flavors of cherries and black pepper but still had a very slight hint of vanilla on the finish… very seductive. My second glass of the night was a 2004 Barahonda that was also smooth and dry but, like the Educated Guess, did not pair as well with the foods as the Estampa.